eSoftTools EML to Thunderbird newly designed to convert EML files to thunderbird, now it became so simplest for clients that without losing information from EML files and having protection of internal EML file data virtuously convert EML files (Selective OR Multiple) into thunderbird. Software has the influence to extract messages from EML file which supported multi mail clients (Outlook Express, Windows Mail, Live Mail etc.) and convert them into thunderbird .mbox file with data integrity. Tested over 18,000+ EML files to Thunderbird MBOX conversion at a time. Easy to perform Bulk export of EML to Thunderbird. Users can export EML to Thunderbird without harming single bit of email elements, email formatting and settings. Support successful conversion from external storage devices of EML files to Thunderbird. Availability to create separate MBOX file for every selected EML folder. Unique conversion efficiency permits to export EML with attachment, mail formatting, styles, font-sizes and embedded images. Batch Mode Execution; eSoftTools EML to Thunderbird allows to convert numerous EML files into thunderbird at single conversion cycle. One Solution, Unlimited Benifit: The converted file .mbox can be opened by Thunderbird, Entourage, Pocomail, Seamoneky, Postbox, MailCopa, The Bat! etc.. 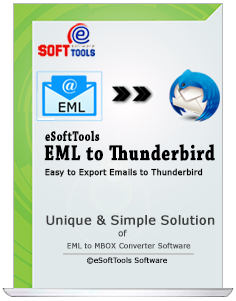 Importing emails from EML files to thunderbird is not a big task or challenging phase for users because with this outstanding eSoftTools EML to Thunderbird Converter software proofs nothing is impracticable, this program is capable to convert EML files to thunderbird along with complete emails properties, embedded images and attachments etc. For this utility, not require to have any technical expertise to use this software functionality because its GUI phase is very users friendly and produces so simple guidelines for importing the EML files to thunderbird with preserve folders structure. Software conveniences to add ‘n’ numbers of EML files or Folders by two option. EML to Thunderbird Software now performs as user’s choice, it allows to convert selective single or multiple EML files/folders into thunderbird having the complete attachments items and preserving emails formatting. While conversion, you don’t need to worry about the data because software is free from all virus attacks and preserve the emails formatting and attachments integrity. Software never harm EML file data during conversion EML files to thunderbird. For user’s satisfaction, we provide the facility of demo that users can use at free of cost to check how to operate the software and come to know how to import EML file to thunderbird. Users can also restore 10 emails from EML files to thunderbird free of cost. Demo Limitation - Free demo of EML to thunderbird tool allows users to restore 10 emails per EML folders into thunderbird at free of cost only for checking the software performance. Choose distinctively EML files from various storage locations.